The 2011 Roush Mustang comes in several performance and options package levels. The Roush Sport includes the aerodynamic body kit, splitters, spoilers, billet grille, and graphics. Stage 1 adds performance wheels, tires, more graphics. Stage 2 adds upgraded handling. The RX5 adds a R2300 Roushcharger allowing the 5.0 liter V8 to put out 525 horsepower. 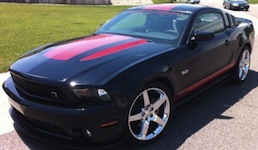 Check out this limited edition 2011 DUB Mustang. It's a collaboration between Ford, DUB magazine, and Roush Industries. The DUB edition is available on the V6 Mustang coupe, convertible or glass top painted Black, Race Red, Ingot Silver, or Grabber Blue. Modifications include; Roush front fascia and splitter, Roush lowered suspension, 3.31 rear axle, quarter window covers, windshield banner, DUB stripe package, black interior with DUB embroidered into the headrests, unique 20-inch Pirelli wheels, and TIS tires. Red Candy 2011 Roush Mustang owned by Steve from the United Kingdom. It has the 5.0L V8 engine and a manual transmission. Steve purchased this Roush Mustang in August 2015 after seeing the vehicle advertised by the Mustang Owners Club of Great Britain. The previous owner making way for RHD 2015 Mustang. This is an Ingot Silver 2011 DUB Mustang coupe. DUB is a $3599 package on the V6 Mustang created by Ford, DUB magazine, and Roush Industries. You can get it on the coupe or convertible. This is the first one I've seen. Hero card for the 525hp, supercharged, 2011 Roush 5XR Mustang coupe. It has a R2300 Roushcharged 5.0L V8, upgraded handling, Roush body kit, Billet Grille, 20" Chrome wheels with Cooper RS3 tires, Roush graphics, and upgraded interior.